We were pleased to welcome for our evening talk Mark Gibbons from Cotswold Astronomical Society who had done in-depth research about "Mayan Astronomy". He said that he had become interested in their history and especially their knowledge of astronomy as we approached the year 2012. For, the popular press at that time had picked up on the idea that the Mayan calendar had predicted the end of the world was about to occur on 21st December 2012. Mr Gibbons stated emphatically that he, of course, thought this idea was ridiculous and said that the truth was that on that date it was just that one of the cycles of the Mayan calendar was ending. The Mayans had many calendars and this date marked the end of their long-period calendar before it began again; just as our own Gregorian calendar starts again on January 1st. He then explained that the Mayan tribes had no astronomical instruments to use, such as a telescope, but all their observing was purely naked-eye. 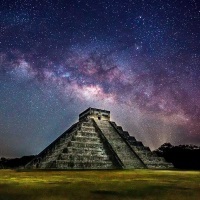 Despite lacking such technology the Mayans made remarkably accurate astronomical measurements over long periods of time that are very close to modern values. Much of their architecture and cities were arranged to fit with the movement of celestial objects such as the Sun, and they even had purpose-built observatories that were placed on high stone structures to lift them above the surrounding vegetation. One of the most well-known observatories is the Caracol at Chichén Itzá, which was the principal city on the Yucatán Peninsula. This was built in such a way to follow the path of the planets, and especially Venus, throughout the year. Venus was very important to the Mayans as the tribes were very warlike and they thought it auspicious to wage war when Venus was rising in the morning sky. They had elaborate glyphs for the planet and various names such as the red star, reddish wasp, big star and the great eye. For the Mayans did not study the sky purely to gauge the passing of the seasons but to forecast the future will of their various deities. They believed that the gods guided the Sun and Moon across the sky and that they even needed human help with this. This help came at a terrific and grisly cost in the manner of human sacrifices and yet the victims saw this as a privilege as they would then become immortal. Mr Gibbons ended his talk by saying that much of what we know about the Mayans, and their culture and knowledge, comes from a small set of surviving documents called codices. There would have been thousands of these reference books in use at the height of their civilisation but, sadly, with the arrival of the Spanish most of them were destroyed. Only four codices survive to the present day and the most famous one is the Dresden Codex; named after the German city that it was rediscovered in. It is speculated that the codex was sent as a gift to the Holy Roman Emperor Charles V from the governor of Mexico.